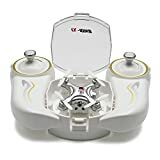 Best Cheerson Drones 2019 – reviews of the top cheerson drones for sale in 2019. Find out which Cheerson Brand drones are best. Featuring Cheerson 33-S, CX-35, CX-91 and more. Cheerson Hobby Technologies, a China-based company specializing in RC toys, was one of the earliest entrants in the drone market. They churned out their first products way back in 2003. 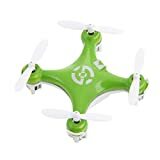 They were also the first to introduce the palm-sized nano or micro quadcopters that came with built-in cameras and some of Cheerson’s microcopters continue to enjoy huge popularity among drone hobbyists at the current date. Over time, however, Cheerson has come to include a wide variety of other drones among its roster, too. These include FPV racing drones, semi-professional G0Pro supported products, etc. and what makes some of these products particularly endearing to ‘droners’ is that for all their amazing features, most of these are available at extremely affordable prices. So, let’s have a look at some of the best and most popular Cheerson drones available today. When it comes to tiny drones, you won’t get a tinier one than Cheerson CX-10C. To boot, this is also the smallest quadcopter to include a built-in camera! For a bit of the back story, the iconic Cheerson Cx-10 used to be the smallest drone when it was introduced. However, it was not long before that Cx-10 lost that status to competition, so Cheerson came up with the present model to reclaim the record and now with a built-in camera to it! Just to give you some perspective. Now, as to the features of this nanocopter, it has a flight time of 4 minutes. However, if you are sho0ting videos, this will come down to approx two and a half minutes. The battery charges pretty fast though (30 minutes), so you may give it a go many times a day. However, make sure to allow some cooling time for the motors after a spin, otherwise they will burn out too soon for your comfort. 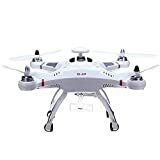 The drone houses a small 0.3 megapixel camera that is able to shoot both photo and video and courtesy the 2.4G transmitter, you can operate the drone in three separate flying modes as well. In comparison to Cx-10, the present model is somewhat easier to fly and maneuver due to the added weight of the camera, so this one is even more suitable for complete newcomers. The drone is priced at $21, so ideal for first timers looking to get a feel of the hobby. As you can expect, the drone is not too sturdy, so a few crashes can spell the end of it! Thankfully though, the manufacturers had enough oversight to include spare blades in the box and we appreciate that especially. Now, to come to Cheerson mini copters. As we had mentioned, Cheerson really made a name for itself for being the first RC toy manufacturer to come up with mini or nano quadcopters. Variants of Cheerson Cx-10 models are still highly popular with first time flyers or indoor pilots. With CX-OF equipped with optical flow sensor, Cheerson has come up with a model that can be considered as a worthy successor to its earlier nano series copters. The present model includes all the features of the latter ones but with some cool extras that drone hobbyists are sure to appreciate. The 0.3MP camera of this drone comes with a wi-fi FPV transmission feature. You can access the first person view feature through the integrated flying app on your smartphone. The transmitter comes with a phone holder, so you don’t need to switch between your phone and transmitter. In the box, you’ll find, along with usual parts, a blade removing tool and an extra set of propellers. You get about 5 minutes of flying time and the drone can be operated in three different flying modes: Trajectory, Selfie and Dance mode. You can do 3D rolls and flips and the model, of course, includes functions that you get in Cx-10 copters, such as one-key take-off & landing, precise auto-hover, etc. The miniscule 640 x 480 camera can record video at 16 frames per second and as for the optical sensor, expect a sensing distance of 3-4 meters. All in all, a pretty awesome set of features for a machine which will set you back no more than 18 dollars! Adopts 6-axis gyro stable system-Which makes it with easy operation and good stability. One-key to take off-Which allows the control more convenient and more suitable for new player. To come back to somewhat pricier models, here is Cheerson CX-35, a drone that pretty much punches above its weight. At $180, this is one of the rare mid range drones that include brushless motors and come with superior altitude hold function. This is also a FPV drone. The transmitter comes with a 4.3 inch FPV display, but the FPV distance is not impressive enough. You can however set this right by adding an external wi-fi antenna to the transmitter. The model allows decent aerial photography, too. You can capture 0.9 MP photos and 720p videos. More importantly, the camera is equipped with four vibration reduction balls and this will allow you to shoot smooth videos. The camera also comes with the free-tilt feature. However, for all its positives, the model has one major SHORTCOMING which is its battery life. Although the battery can be recharged quickly, it only gives you a maximum 7 minutes of a flight time, which is a bit of a letdown! Again, this is another record holder in terms of ‘small’ in that this model is known to be the smallest quadcopter with both Wi-Fi FPV and Altitude Hold functions. In fact, the CX-10WD can be seen as a combination of two previous Cheerson models: CX-10D (with altitude hold) and CX-10W (with WI-Fi FPV). At $33, this is a pretty neat toy which will let you shoot aerial images of 720 x 576 resolutions and you can capture about two minutes of video. You will get about 3-4 minutes of fly time with its 150 mAh lithium pro battery which is not too bad taken into consideration the load the battery takes for the on-board camera, motors, LED lights and the wi-fi module. Once the battery is low, the LEDs will start to flash as a warning sign. Similar to the earlier model, recharge time is about 30 minutes. DRAWBACK: Although the model is advertised as a FPV drone, you may experience some lag in FPV and it is difficult to fly the model in real time FPV mode. Another of our favorite Cheerson models for the value you get for your greenbacks. This is a semi-professional model—in many ways similar to DJI Phantom (minus few of the latter’s features) but available at one third of the price you pay for the DJI model. The drone has a flight time of about 15 minutes and this can rival many of the higher end products. Both control range and flying altitude (with an altitude hold function) is measured at 300 meters. What we like particularly about this one is that the charging time of its 20C 3c 2,000 mAh is no more than 2 hours. Which means even without an extra battery, you can make it go for a spin multiple times a day. The drone supports GoPro and you can mount light and handy action cameras to get some great footages. This GPS-enabled CX-20 model is available in different versions such as CX 20 Auto-Pathfinder, CX 20 Bigshark, etc. But we suggest that you get an open source version which will let you use the Mission Planner software and will allow greater flexibility when you want to get some add-ons or tweak its settings. For example, many users of this model like to attach add-ons like a telemetry transmitter, a FPV transmitter, some homemade tablet, etc. in order to get more out of these drones and to streamline it even further. However, when attaching add-ons, keep it in mind that you should not use this drone with a wi-fi FPV transmitter. Apart from being visually attractive, the model also features a highly integrated and streamlined design that lets you stow it away easily into your backpack. As for functions, it has an auto-return, low-voltage alarming and GPS hold system and it offers two separate flight control modes: the Attitude control and GPS control mode. The drone also offers you great flexibility in terms of maneuverability with its side flying, forward/backward, up/down, and left and right turning and it can travel at a max speed of 22 mph. even in windy circumstances, it is reported to fly stably at 15mph which is pretty awesome for a model priced at $260 or thereabouts. In addition, the MX Autopilot System, built-in within the machine, includes an Intelligent Orientation Control function which prevents the machine to fly out of control during tricky spins and so on. 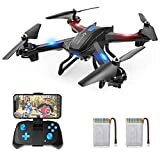 Again, a great machine for its price and with some add-ons, you can upgrade it to the level of the drones available at the price range of $800 and more. DOWNSIDE: Some users have complained that their CX 20 have flown away too easily. But this may be due chiefly to the inexperience of the flyer and incorrect flying operations. For example, if you fly the drone in a new area, you must always calibrate the machine before flying and must also wait till the GPS is locked into it. Otherwise, you run the risk of the drone flying away. With camera of about 0.9 to 1 mega pixel. About 500 meters control and 300 meters FPV distance. You can enjoy its good performance of hover, side-flight and 3D rollover with beautiful LED light. Let’s start with this amazing FPV Racing drone that was introduced by Cheerson back at 2016. 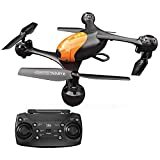 We say amazing because this drone packs a good amount of sophisticated features at an almost incredible price of about $190. Along with 3D rollover, side-flight and hover, this drone is unique in its ability to allow inverted flying. If you want to wow your racing partners or onlookers with some amazing acrobatics, then this is it! Beware though, that this drone is designed keeping experienced flyers in mind, so if you’re a beginner or are not too confident about your flying skills, we suggest you resist the temptation to use these fancy acrobatics for the time being. This copter, however, allows you to operate it in two different modes: the easy elevation or steady rise mode and the manual mode. As a beginner racer, you will be well off using the former mode since in the steady rise mode, the drone can balance by itself and, thanks to its electronic speed controllers, is able to avoid obstacles in its course, too. Manual mode, on the other hand, lets you perform some fascinating acrobatics such as barrel rolls, invert loops, etc. Also, you can operate the drone at different speed modes and theoretically at least, the drone can notch up a max speed of a whopping 80km/hr! The flight time is about 12 minutes, made possible by the drone’s powerful 11.1v 1,600mAh battery. The 5.8G 32 CH real time transmitter includes an FPV monitor and the automatic search frequency feature. You’ll get FPV signal for its usual control range of up to 300 meters. The four 1805 brushless motors help maintain a good balance between power and safety. There is an automatic landing plus a low-voltage alarm that will help you avoid nasty crashes. To cap it up, this quadcopter also includes a 2MP camera that lets you take reasonably good footages at a resolution of 720p. In all, a great racing drone that gives you good value for money—and much more. We had mentioned the versatility of Cheerson products. So, to end our list, here is a tri-copter and chances are that you’ll fall for it for its great design alone! This is a 5.8G 4 CH FPV drone with live transmission features and a 2 megapixel HD camera. Although termed a tri-copter, one may also call it a hexacopter since each hand is fitted with two motors and two propellers. The drone has a 6-axis gyro and other highlight features include its dual spring control sticks and a high-density air pressure sensor which does a great job of holding the height accurately enough even when the drone is flying at a comparatively high altitude. The flying time is 6 to 7 minutes and the control range as well as FPV transmission distance is 30-80 meters. Conveniently priced at $99, the only DRAWBACK of this machine is its charging time of about three and a half hours. Your selection criteria for a drone should primarily depend on what type of drone you are buying, meaning the price range of the drone. For mini quadcopters, Cheerson’s specialty, we suggest you look for two things especially: the drone maneuverability (since a drone with a good range of acrobatic functions will help hone your skills) and the availability of spare parts (since, it is assumed that, as a beginner, you will crash your gizmo a good many times!). On the other hand, when it comes to low to mid range drones that are not mere toys (we’re talking drones priced at $70 or above), the prime criterion should be the build quality of the machine. Yes, features are important, but when you are investing on a toy that is priced at around a $100, you want it to last and not go dead on you on its second or third crash! The last two items on our list, the tri-copter and the Cx-33S both fare pretty well on this regard. For models on the higher end of the spectrum, such as the Cheerson CX-20 or the far costlier CX-22 ($600), look primarily for add-ons and further upgrades that the basic unit supports. Since these models are normally used for professional purposes, not too many things are included in the box and you’ll need to spend some extra bucks to exploit the full potential of the machine. With a brand offering products of such a versatile price range, you cannot give any avg. price data on Cheerson models. But, as we mentioned earlier, when it comes to Cheerson, you can always expect to get good quality products at highly competitive prices. When it comes to mini copters, Cheerson wins the day thanks simply to the huge number of models that they are able to offer in this category, and for most of them, with some sophisticated features, to boot. And a majority of them are also the tiniest ones you’ll find in the market. And spare parts for these models are available at a paltry $4/$5. As for low to mid range drones, Cheerson excels in terms of features they pack in the units for the prices they are offered. However, all of these models are not the sturdiest ones, so if that’s important for you, pay particular attention to user reviews for the model(s) you have your eyes on. Finally, although Cheerson is not a brand recognized for heavy duty professional/industrial grade drones, some of their higher end models do a pretty good job and they are worth a try if you’re looking for some semi-professional drone. As with the CX-20 model on our list for example. 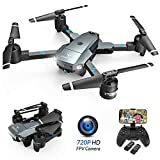 If you spend an extra $200 on upgrade and add-ons (so, a total of about $450), you get a pretty handy drone that is able to compete with models that will cost you at least double that price.